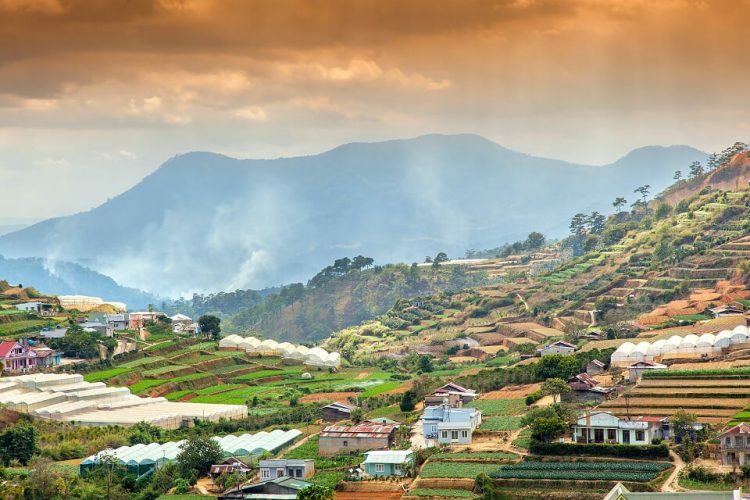 Traveling to Dalat with the full and most comprehensive guide from Luxury Travel. Dalat travel guide introduces interesting destinations, places to eat and more useful information for you to visit before coming to this beautiful flower city. Dalat is the capital of Lam Dong Province. At 1,500 m above sea level, Dalat has a cool atmosphere and it is the ideal resort in the South. It is once famous for its attractions such as the Valley of Love, Than Tho Lake, Hill of Two Tombs and Elephant Falls. Dalat today can no longer retain the wild look as before. 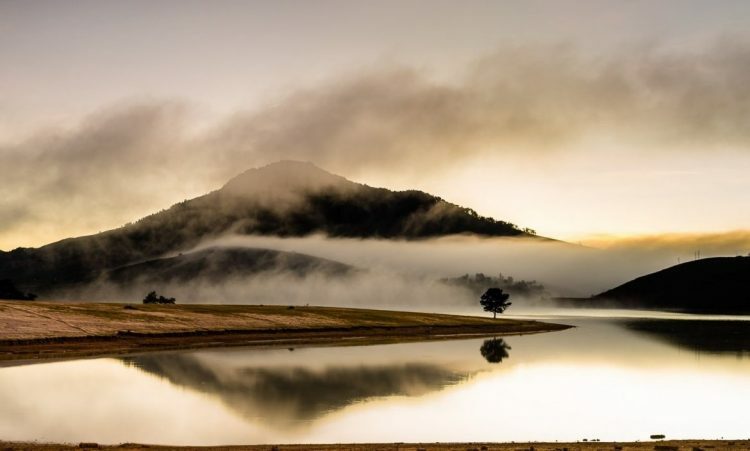 The main tourist attractions of Dalat include Xuan Huong Lake, Langbiang Mountain, Bao Dai Palace, Tran Le Xuan Palace, Truc Lam Zen Monastery, Tuyen Lam Lake, Dalat Train Station (Trai Mat Station). Only about 300 km from Saigon, Dalat is a great place to relax and get away from the hustle and bustle of the southern delta. V. ABOUT LUXURY TRAVEL LTD. Unlike other tourist destinations which are only seasonal, Dalat can be reached year round because each season has its own beauty. You can freely choose the best time for your trip to Dalat. If you want to watch the cherry blossom blooming around Xuan Huong Lake, from February to April when the spring comes is the most beautiful time to see the flowers. The purple flowers on the streets at this time also began to show off the sparkling flowers in the spring light glow. During the rainy day, sunshine suddenly comes and goes very quickly, making Dalat tourists make astonished. Let’s go about a trip to Dalat with the peaceful weather and “strange” summer days cannot forget. The rainy season in August will increase the attractiveness of the waterfall. In the autumn, if you travel in Dalat in October, November or December, the clouds are hovering in the blue sky. From October to December, the sunflowers reach for their beautiful sunshine and shine in the new wind. The flimsy mimosa leaves spread along the plains like a painting. And there are many other brilliant flowers such as white field, sunflower garden, velvet rose garden and reeds field. Each season is Dalat show with its own performance and always attracts visitors. There is a very nice second-hand clothing store, along with specialty items like mulberry juice, artichoke tea, dried broccoli, jams and beans. Dalat Market is not open at night (open at 7:00 and closed at 19:00 daily). 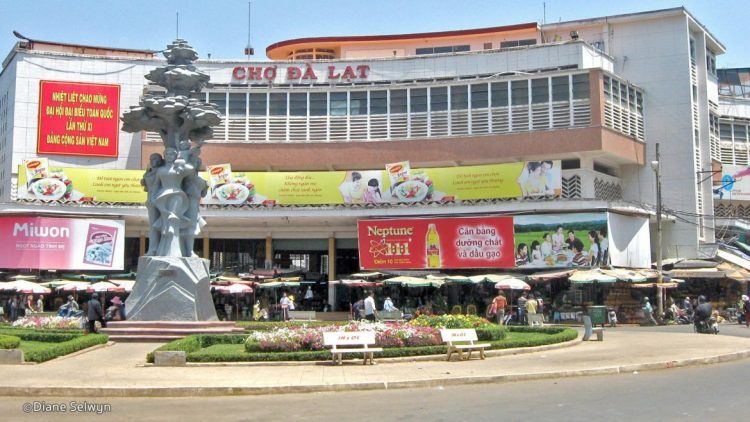 However, Sheol Market (“Cho Am Phu”) appeared with items such as wool, food, vegetables and fruits for tourists to shop and walk at night in downtown Dalat. Early morning and sunset is the most beautiful time of Xuan Huong Lake. There are duck boats, motorboat races or rubber boats on the lake. Any visitor to the center of Dalat city must be surprised by the beauty of a year-round blue lake known as the heart and the jade of the dream flowers city. Xuan Huong Lake is extremely romantic. 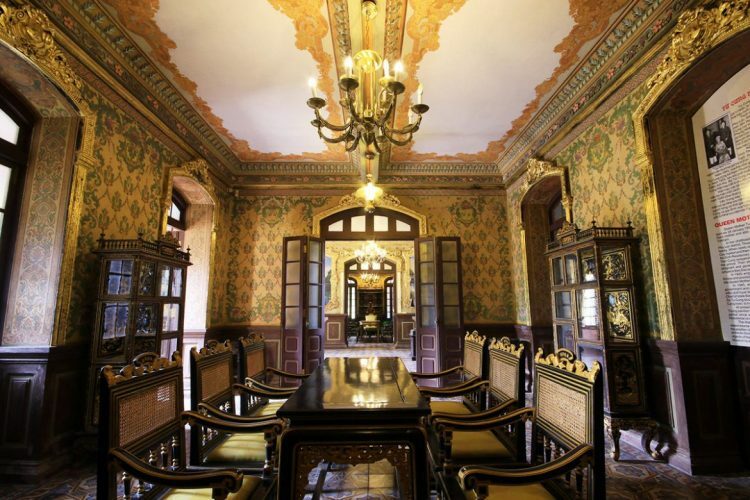 A beautiful and elegant palace located on a hill 1539 m high. Location: Trieu Viet Vuong Street, 2.5 km south of Dalat center. 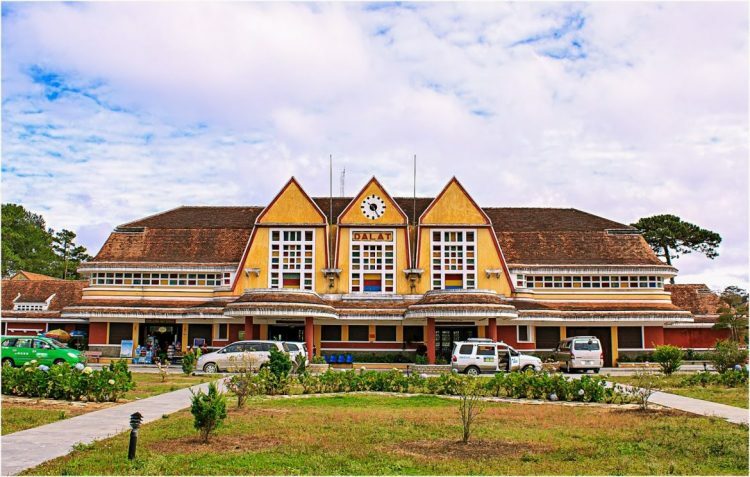 Dalat train station – An unforgettable natural landscape. Address: No.1 Quang Trung Street, Dalat City, Dalat station. This is a familiar shooting location of visitors. When the train climbs to the Bellevue pass, passengers will have a wonderful feeling with the scenery: on one side is green mountains, one side is immense space, stretching endless to the faint horizon. The far side is the Pacific Coast. The scenery changes dramatically in every terrain until the train reaches the summit, the haze-covered Lam Vien plateau and begins to approach the pine forest. It is located at no.2 Phu Dong Thien Vuong, 2km from the city center. Those who travel to Dalat often visit flower gardens to admire the colorful flowers and hunt beautiful pictures. Dalat flower garden is a wonderful wedding location for couples to travel to Dalat. Talking to this place, everyone knows that this is the place where all the beautiful flowers of Dalat and the world are gathered. 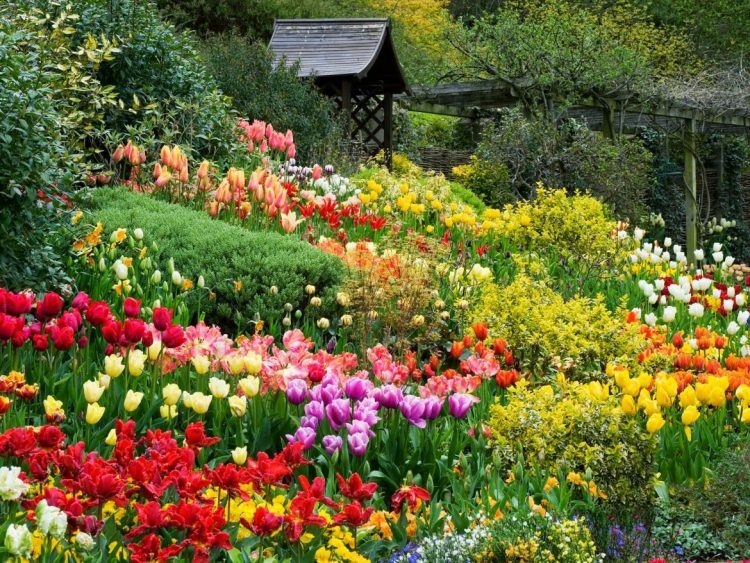 At every Flower Festival, the Flower Garden is one of the most popular tourist destinations. At the top of the bell tower is a large chicken. 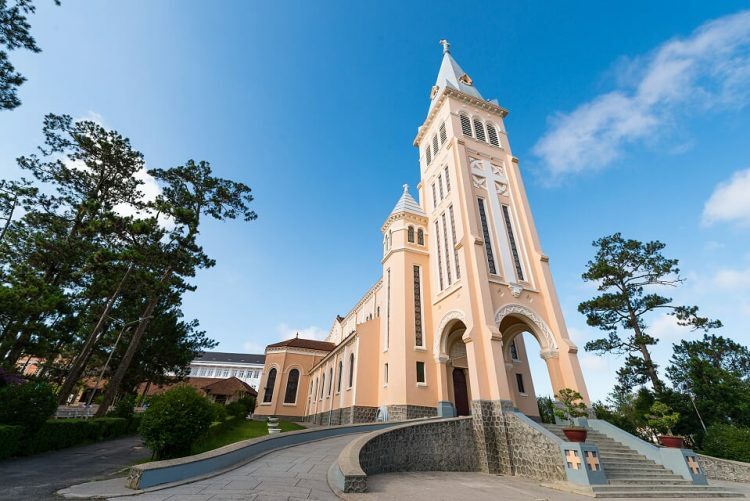 This is the largest church in Dalat. It is also one of the most ancient and architectural buildings of this city left by the French. 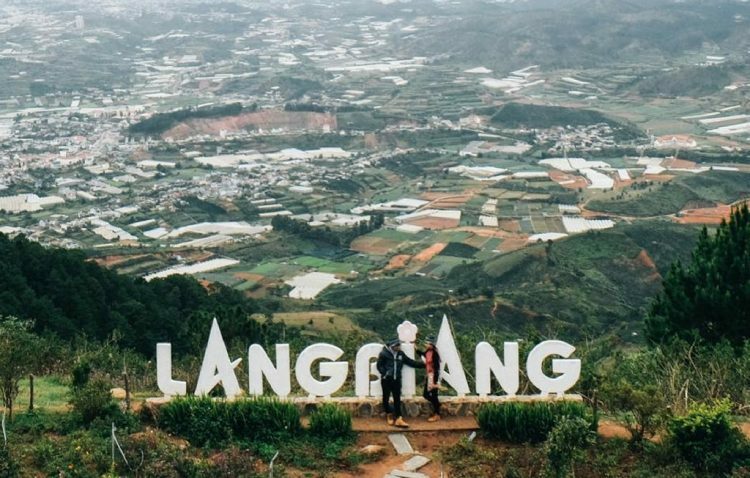 It is on the top of Tung Lam hill, 10 km far from the center of Dalat city on the way to Suoi Vang. 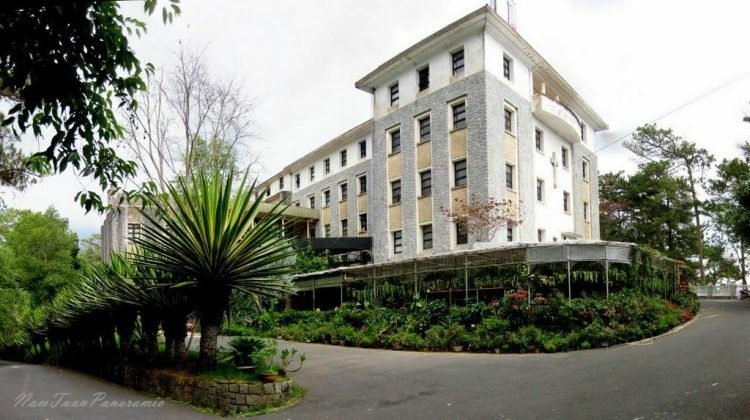 In addition to the beautiful scenery, the Institute of Biology is also a museum of animals and botanical gardens. People also call it as Mai Anh Church. The church is on Ngo Quyen Street, about 1 km southwest of the center. 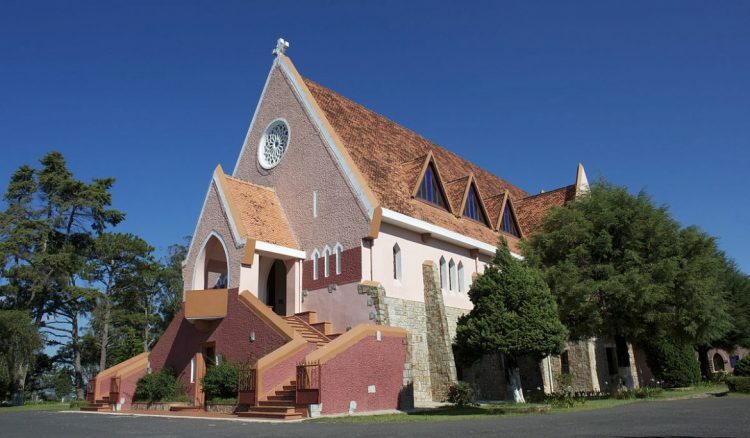 The church was built in the style of Europe in the 17th century, with a harmonious combination of Western architecture with the architecture of ethnic minorities in the Central Highlands. 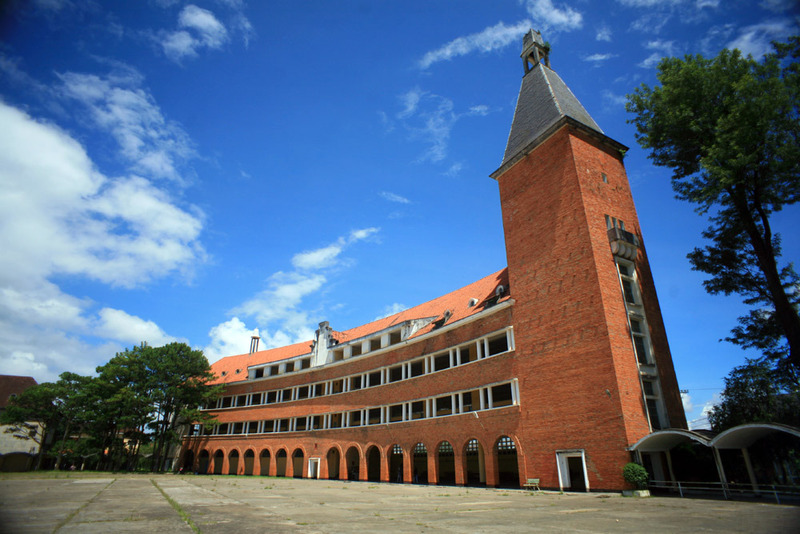 It is recognized by the World Association of Architects as one of the 1,000 unique works of the world in the twentieth century. The highlight of the arcade is the bell tower, called “Curved House”. At Trai Mat, there are tourist attractions such as Bao Dai King’s Resort, Trai Mat Market or Linh Phuoc Pagoda. 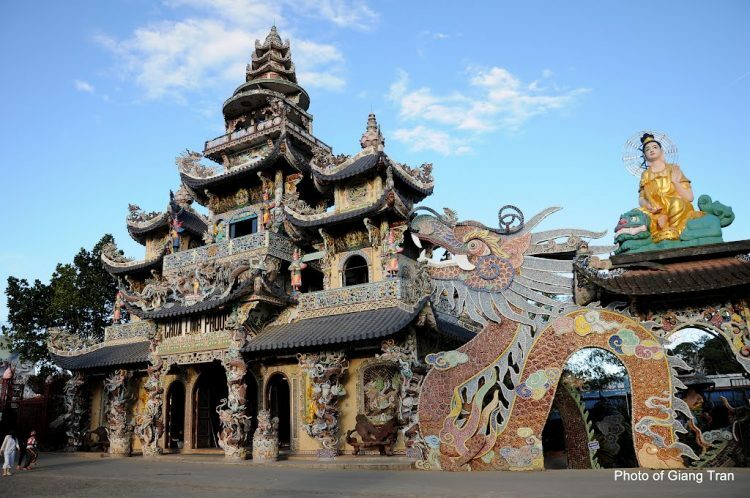 Linh Phuoc Pagoda is unique in architecture, especially dragon statue made of 12,000 bottles of beer, so the temple is also known as Ve Chai Pagoda. 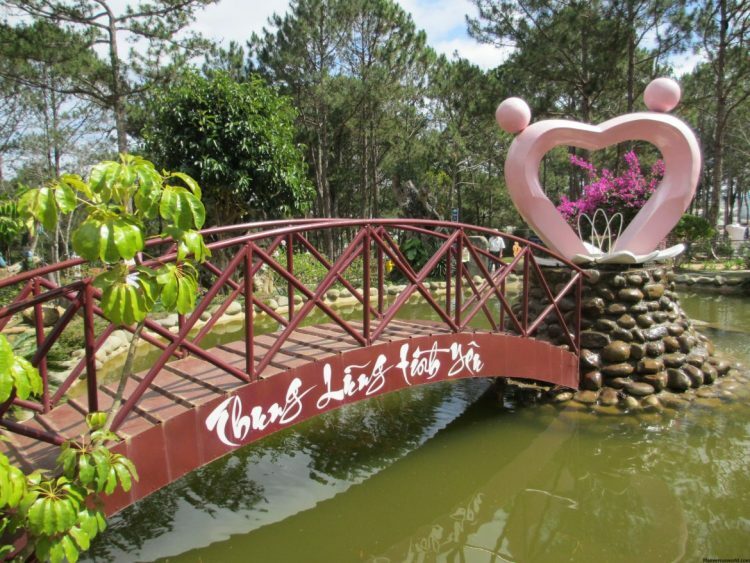 It is the most romantic and lyrical place when traveling in Dalat, about 6 km to the northeast of the city. You can go up the Vong Canh hill and enjoy panoramic views of the Valley of Love. From the center of Dalat to the north to Lac Duong, to km 7 Tung Lam, then you turn left, crossing the road about 12 km, you will get to the Suoi Vang. The Golden Stream is beautiful, so bring food and spreadsheets to start the picnic anytime you want to. At the foot of the mountain, there are two options: climbing or jeep. The jeep’s total cost is about VND 200,000. If you go individually, you have to wait for the car until there are 6 people, and each person has to pay VND 50,000. The route goes about 15 minutes to the top. If you choose climbing (take the asphalt to the top), you have to go about 7 – 8 km and it takes 1 hour and 30 minutes to the top. On the road to the top of the mountain, there is full of pine and flowers. At the top of the mountain is a fascinating scene, and you can also enjoy the barbecue here. Here you can rent boats to the island. A round trip is VND 200,000, so you should rent with other guests to save your money. Or you can go around the lake (turn left) en route to the island. Go to the island to enjoy the wild meat. Remember to bring the canvas to spread. Beautiful scenery makes it is suitable for taking pictures and selfie. This is not only Lam Dong’s largest monastery but also an attractive tourist attraction of Dalat. In front of the monastery is a cable car station. Take the cable car to see the city and the pine forest (VND 50,000/return ticket). Located at the beginning of Prenn Pass, on National Road 20 from Saigon to Dalat, Prenn Waterfall is 10 km south away of the center. Coming to the Prenn waterfall, besides watching the spectacular waterfall and the vast pine trees, visitors also have the opportunity to enjoy specialty snake porridge with the price from VND 160,000 to 200,000 for 4 people to eat. Datanla attracts visitors with clear water flowing through seven layers of rock and then pour down the large stones with white foam. Tao Ngoi Restaurant at the beginning of 3/4 Street (about 2 km from Xuan Huong Lake). A pot of chicken with “e” leaves is VND 200,000, including about half a chicken cut in pieces, a large plate of vermicelli, a plate of mushrooms, bamboo shoots, and of course, a plate of basil to try on. The second hot pot dish to taste in Dalat is the beef hot pot in Ba Toa. The beef here is famous for the thick, big and long pieces. Not to mention the price of hot pot is very reasonable, a pot of meat for four people to eat is only about VND 250,000. Ba Toa area is filled with hot pots, but the most famous is A Ba Toa, Thanh Tam. In addition, Ba Toa hot pot of Wood restaurant on Hoang Dieu Street is also a worth visit. The restaurant is on the Ankroet Road to Cu Lan village. The owner is a couple of J’rai. It is special because of the strict rules that the owner set. To eat, you must call in advance one day and when you have to read the password which is the last three digits of your phone number. It also appears on Google Maps, so check “Com lam Ayun” and you can find the way easily. The unique combination between wet cake and chicken’s viscera has attracted the curiosity of many visitors when coming to Dalat. Then, when tasting, everyone is interested in the very strange taste that is enticing of the dish. It is the soft and sweet taste of chicken. To enjoy, you go to a wet cake restaurant on Tang Bat Ho Street, near Dalat Market. Go along Bui Thi Xuan Street until you see a small, warm restaurant. When seeing many people gathering and the friendly owners, you will come to the right place. A homemade VND 21,000 cake consisting of chicken eggs, a slice of cheese, liver pate, dried beef, and mayonnaise. Made from lean pork and grated on a chopstick, cooked ripe, eaten with rolls fried crispy rolls, pickles and herbs, the baked roll is one of the dishes not to be missed when traveling Dalat. The highlight is the sauce made from liver, shrimp, meat and mashed peanuts making a very special mixture. Besides the well-known Ba Hung, along Phan Dinh Phung Street, there are also many baked rolls restaurants. Located at the fall of the University, on the way to Lang Biang, Cong Beef Noodles is the famous breakfast address in Dalat. A bowl of noodles is only VND 35,000 but it is big and full of meat with pork. In the frosted morning of Dalat, call a bowl of noodles with hot cups of soy will make you load enough energy to prepare to climb Lang Biang. This dish is very famous for Dalat people, especially the restaurant on no.33 Hai Ba Trung Street. The snails are stuffed with lean pork, finely chopped, add a few slices of citronella to deodorize, making you want to eat as soon as you see this complex of snails. The owner said that the reason for this dish is especially thanks to the cup of dipping sauce recipes of the first owner. Sometimes you have to wait 5-10 minutes for space. The price is about VND 50,000. A bowl of soup includes fried fish, fish balls, pork-pie and meat. Especially the noodles are made from grinded rice in the one-of-a-kind way of the restaurant. This is one of the delicacies in the morning of the Dalat people because the food is warm and suitable for the cold of the region. Many restaurants on Xuan Chung Street on the side of the Chicken Church sold this dish, but the Xuan An of no.15 Nha Chung Street is considered by many visitors as delicious and the best. Soy milk a familiar drink for many people, but soy milk in hot air in the cold air of Dalat is a very different experience. Besides soy milk, you can change the taste by green beans, black beans or hot cocoa. Various pastries at the street vendors are selling this drink in Dalat night market. This is a dish that many young people “tracing” when coming to Dalat. It is made like the ordinary yogurt but cleverly added cheese in the ingredients. Tasty fat yogurt is sold at no.48 Khe Sanh Street, at the price VND 7,000 for a pot. The cold weather of Dalat makes chicken soup and chicken vermicelli be attractive. After wandering the city at night, stop at the small shop, enjoy cooked chicken soup, put onions and pepper to warm the body. The good restaurants you should visit are on Phan Boi Chau, Nguyen Cong Tru and Huyen Tran Cong Chua Street, for VND 25,000-30,000/bowl and chicken salad from VND 40,000 a plate. Serve with bread is a bowl of bone broth with tiny meat, plus a little green onion, but when you eat, it is actually out-of-words. There are three popular ways to enjoy: to toss the bread into a bowl of bone broth, place a large piece of bread at the top of the broth or put it in the center of the bread. You can go to Tran Nhat Duat – Hoang Dieu intersection to feel the taste of the dish. The new 360-degree view of Cau Dat Tea Hill is now one of the most check-in spots of young people visiting Dalat. It is built in the middle of the tea hill, the tree-lined café which is painted with outstanding colors is suitable for tourists to enjoy 360-degree views and feel close to nature. Especially, when coming here you will enjoy the hot cake and coffee fresh. How delicious they are! Dalat has a lot of beautifully designed coffee shops, and Panorama is one of them. The coffee shop looks like a glass house suspended in the sky. As the name implies, from any sitting position of the bar, you can also zoom out 360 degrees around without being out of sight. The shop is designed elegantly around the glass. The plus point of the restaurant is a super nice view, from here with a horizontal view, you will see the car going downhill, look up to see the cable car which is quite beautiful and especially see the pine forest. Located at the 1st floor on 90 Bui Thi Xuan Street is a coffee shop built on the idea of greenhouses in Dalat with glass space. As soon as you step into the restaurant, you will see the trees everywhere, making the space of the restaurant in green. The menu is varied from traditional coffee to matcha or Italian Coffee with prices ranging from VND 20,000-59,000 depending on type. In addition to drinks, to the THONGDALAT.space you can also enjoy different types of cake like Brownie or Salted Caramel, which is extremely attractive. This is one of the first North European style cafes in Dalat. The coffee shop is strange and suitable for living virtual. Especially, in the restaurant, there is a place designed exactly like a camping tent. Let’s come here and take the best shot. UP Coffee Dalat fascinates visitors by the space style which is both “vintage” and modern. You will feel extremely warm in there. The shop is divided into many areas, from the indoor, the area close to the window with the terrace and has its own interesting. The design of UP Coffee Dalat is very well invested and creative. Mainly home furniture is a small wooden table with deep brown, each table is also placed a small delicate flower. The highlight of UP Coffee Dalat is the view of the whole city of Dalat, with Langbiang mountain, Hon Bo mountain, the Governor General, Palace 1,2,3, Robin hill, post office and Chicken Church. It Still retains the wild beauty of the forest, but the owner of the “Ma Rung Lu Quan” has created a “fanciful” scene from the aquarium, bonsai and wooden houses which are fascinated visitors when they arrive. You will have to cross the rugged soil and rough rocks about 25 km from the center of Dalat city in the direction of Suoi Vang. Although the road to reach this place is a bit difficult, but once you have conquered the street, you will admire the beauty of this place. About 3 km from the city center, follow the 3/2 road, go to Sai Gon – Dalat hotel and turn left to Cam Ly, you will admire the famous flower village and the oldest one in Dalat. Not only the large green flower fields, but the petals of all kinds (from simple white to pure white, rose petals to beautiful gold or red velvet) will also immerse you. The brilliant flower world will make you forget the way back home. With an area of ​​more than 10 hectares of grass, now the white grass hill in Da Sar commune, Lac Duong district has become the ideal shooting destination for many visitors, especially young people who passionate and love the natural landscape, mountains and forests. It is known in the early days of summer, May and June, this grass grows very fast and blossoms white throughout the Central Highlands. To get to this hill, you have to go more than 40 km long, including forest roads, so the most suitable means are motorbikes. Dalat buckwheat garden located in Ta Nung commune, Lam Ha district on the road from Dalat to Elephant Waterfall. Not as big as a field in the North West, but it is enough to make visitors excited and anxious to once come here to admire the attractive pink flowers of the buckwheat. Thien Duc Phuc Hill is one of the most ideal locations for seeing the city. Located in the position opposite Lang Biang so from here you can see the majestic picture of this famous landmark when traveling to Dalat. The most unique here is the image of pine trees on the hill, whose shape is on one side like waiting for someone and they are lonely between the cold of Dalat. Dalat Milk Farm is located in Tu Tra commune, Don Duong district, Lam Dong province. This farm attracts young people to find out by the vast field of flowers, romantic green lake and lovely dairy herd. To Dalat Milk Farm, you ride a motorbike from the center of Dalat city toward Duc Trong district about 25 km. When you meet the Bong Lai junction, then turn left an go on 10 km. It is one of the most sought-after of the youth in early 2016. The Lam Vien Square is filled with exotic and strange architectural elements that allow you to express your own style. Lam Vien Square is located between the “heart” of flower city, overlooking Xuan Huong lake with a total area of ​​72,000 m². Not only prominent with spacious space, but Lam Vien Square is also impressive with works of giant art with flower petal and flower buds are designed with fancy colored glass. This lavender is grown in the Lavender resort area of ​​Dalat, in the Tuyen Lam Lake area (about 7km from the center of Dalat). It is along the way to the Tunnel of Sculpture, but the Lavender Resort is quite wild. The tree is planted on hills of thousands of square meters and makes an eye-catching view. Airplane: There are direct flights offered by Vietnam Airlines and Vietjetair from Hanoi, Da Nang or Ho Chi Minh City to Lien Khuong Airport (Dalat). Ticket prices range from VND 3,000,000 to VND 5,600,000, and it takes from 50 minutes to 1 hour and 40 minutes. You can refer more information here. Note: From Lien Khuong Airport, you can catch the airport bus to downtown with the price of VND 50,000; or take a taxi about VND 300,000/time. Airport buses will run continuously during the day, the last stop in Dalat City is on Le Thi Hong Gam Street, right in the Dalat Market. You should ask the bus driver and the address of the hotel you booked to get off at the nearest stop. 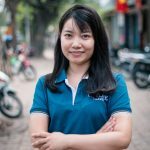 Coach: Phuong Trang and Thanh Buoi Company have many trips of Sai Gon – Dalat route, the price is about VND 230,000 (with bed)/ticket/way. The car runs continuously, each trip from 30 minutes to 1 hour. Motorbikes: prices from VND 80,000 – 120,000/ day. Dual bike: VND 50,000/hour. To rent a bike or motorbike you need to bring ID card. Car rental: The daily rent (from 8:00 to 17:00) from 1 million or more, overtime is VND 100,000/hour. Bus: Bus routes from the bus station in downtown Dalat follow the route to the communes and districts of Lam Dong. Below is the list of some hotels and resorts may suit your needs. How wonderful Dalat is? There are a lot of options and you are wondering which one you should arrange in your trip? Do not hesitate and contact us right now. 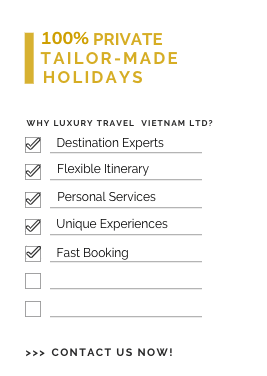 Luxury Travel Ltd. is the first luxury tour operator in Vietnam with 15 years in the travel industry. 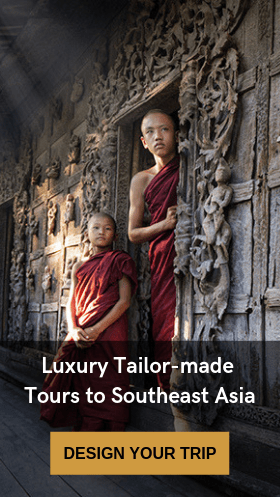 Luxury Travel has won national and international accreditations and awards with its high-end travel services. We offer not only private holiday packages to Vietnam but also other Southeast Asian countries. Because of those, the Dalat tour by Luxury Travel Vietnam also stands out in the crowd. So, let us take care of your vacation.